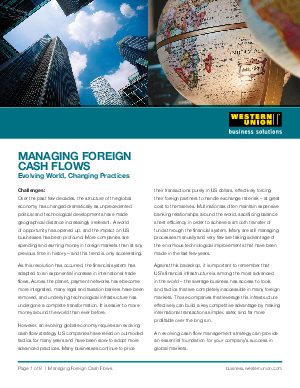 While dramatic changes to the global economy have presented Canadian companies with new and exciting international business opportunities, many firms continue to employ outmoded practices when it comes to managing their foreign cash flows and currency exposures. With access to one of the most advanced financial systems in the world, Canadian companies have a wealth of simple, effective, and affordable financial products and solutions at their disposal. Those businesses that choose to leverage these tools and tactics can gain a competitive advantage by making their international transactions simpler, safer, and far more profitable.